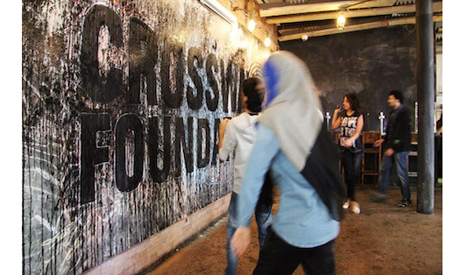 This summer, a group of ten artists from Saudi Arabia, Qatar, the United Arab Emirates, Egypt, Palestine and Lebanon were flown to the UK by the Crossway Foundation, which organises various competitions and expeditions that seek to engage UK and Middle Eastern youth in a two-week expedition into public art. Create & Inspire, a project by the London-based Crossway Foundation, ran a regional search earlier this year to discover young artists, photographers and film-makers living in Saudi Arabia, the United Arab Emirates and Qatar. Artists aged between 16 and 25 were asked to submit projects that relate to the theme selected by Create & Inspire, namely: 'Re-imagining your community'. The winning projects all involved some form of social commentary, presented in various mediums including outdoor installations, photography, video, multi-media artworks, and more. The Create & Inspire winners were; from Saudi Arabia, street photographer Abdulaziz Al-Harbi, street artist Abdullah Al-Shehri, filmmaker Ahmed Al-Shayeb, photographer Mohammed Alhajji, visual artist Mohanna Tayeb; from the UAE, artist Asthma Al-Ahmad, Egyptian conceptual artist Nadine Nour El-Din, and Palestinian visual artist Nour Abuhayeh; and from Qatar, Lebanese-born visual artist Louna Bou Ghanem and Egyptian graphic designer Engy Hashem. Public art is a term that refers to artworks designed to be showcased outside the confines of a gallery space. Such works of art inhabit public spaces instead, with the intention of engaging with the surrounding community. Whilst urban landscapes in the Gulf are in a state of constant development and change, the place of art remains unclear and underdeveloped. The ten winners were invited to travel to London and Yorkshire from 18 to 30 August 2013 for an Offscreen Expedition, during which they engaged with international artists, designers, filmmakers, photographers and curators, gaining exposure to artwork in an entirely different context. In the UK, the artists were able to absorb public art in a different way, while collaborating with major cultural institutions such as the Tate Modern and The Royal College of Art, as well as small-scale art spaces. The expedition, grueling and inspiring, culminated in an exhibition held at the Edge of Arabia Gallery in London on 29 August, and featured the ten winning projects in addition to work compiled throughout the two weeks in the UK. "It's been hectic and intense," Egyptian, Dubai-based conceptual artist Nour El-Din told Ahram Online from London, a day before the exhibition. "But also very fun and really interesting." Nour El-Din explains that the group has been journeying across London and Yorkshire, paying visits to a number of museums and art galleries, in addition to taking part in daily practical workshops. "They've all blended into one day in my head," the artist says. Even though the grueling itinerary has left Nour El-Din's mind in a blur, she clearly remembers a few highlights. A walk around Edgware road, where the participants learned about the history of the place, was one of them. The Mile End Community Project was another memorable experience for the artist. In groups, the young artists went on treasure hunts, discovering the people and places of the area and creating short films that reflect their first impressions. A photography workshop at the veneered Tate museum was also part of the line-up, where the artists learned more about Polaroid photography. "During this whole experience, there's a constant compare and contrast thing going on in my head," artist El-Din reveals. The artists could easily spot the different ecosystem of public art in the UK, compared to a still emerging one at home. "In London not only is there freedom and support for these kinds of works, it's also encouraged, and the communities readily interact with such works,” explains the artist. “In the Gulf region people are only just starting to accept this kind of artwork because they're only just being open to understanding it, and it's just a completely different audience," she continues. The artists have not stopped at considering the ways in which platforms for art and expression differ in the UK from in their home countries. They have been meeting every day to discuss and reflect on their experiences, and consider ways in which the projects they see can be adapted back home. During the two-week expedition, the group went to an artist-run art space in Leeds dubbed Project Mexico, which has inspired Nour El-Din to consider starting a similar project with her friends. "It's something I've always wanted to do, and seeing it and discussing it with the founders and being able to have this conversation has helped me solidify the idea in my head." The artist finds that there is so much that can be implemented in Arab countries such as Dubai and Cairo. Overwhelmed by the magnitude of the ideas rushing through her mind, Nour El-Din has been documenting potential works and projects in her sketchbook along the way.